Standard grade wood dock hardware is designed to withstand the toughest of marine environments. This heavy duty hardware is fabricated from 1/4" x 5" high strength carbon steel, welded via MIG and Robotic processes and hot-dipped galvanized. The hardware is then re-squared to insure absolute accuracy. 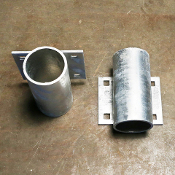 The harware attaches to lumber 1-1/2" to 2-1/2" thick and 8", 10" or 12" high with 1/2" galvanized carriage bolts.